Things That Inspire featured one of the most impressive before and afters I've seen to date. We're all accustomed to 'before' photos of a dated, desperate room followed by 'after' photos of the same space post-facelift. Good, great, wonderful. But what about when the room is beautiful to begin with? The impressive factor is seriously amped. The real estate listing for this Atlanta estate highlighted the kitchen with its gorgeous architectural design, custom cabinetry, and oversized windows. 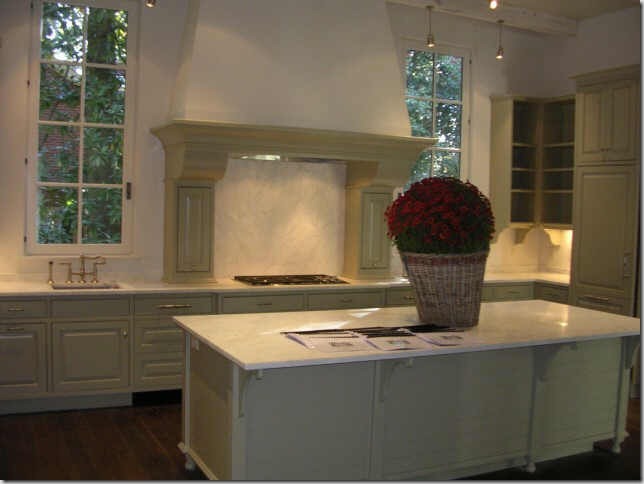 Anyone would be lucky to have such a beautiful kitchen, right? Well, designer Betty Burgess made the great even greater with a few key finishing touches we often discuss here in blogland: paint, lighting, and accessories. It's amazing how several seemingly simple changes can alter the overall look of a space. In this case, the black island adds contrast making the marble counters and surrounding white cabinets pop. The splashes of red accessories and the so-awesome-I-want-one-for-myself-even-though-I-have-no-place-for-it ladder style the room without detracting from the architecture. And finally, the oversized saucer pendants add the much sought-after "wow" factor every room should have. Amazing, right? I highly encourage you to check out the other great-to-greater transformation photos over at Things That Inspire. 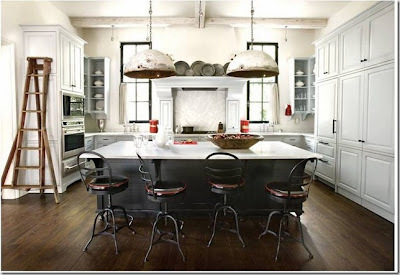 Yes the pendants are gorgeous, and I love those industrial styled stools! Just like the book, "Good to Great"- You're right about the increased WOW-factor! oh! is that the same?! Gorge! Gilly would simply use that ladder to climb up and open the cabinets and eat even more of our food than she already does. Wow, pretty impressive. Those stools are major. looks absolutely stunning! would have never imagined, that this is the same kitchen! Wow, I thought the kitchen looked great before! The after photo is spectacular. Who knew a room could change so much with so little re-done to it. What I now wonder is what window treatments would match well with this decor? I came across your post this afternoon while browsing interior design blogs and the topic of window treatment selection was very interesting to me. It is true that you must dress your windows appropriately to bring out their true beauty. Thank you for writing and as a special thanks to you and your readers, I would like to offer a 20% off coupon using this code upon checkout: BLG20.